Viezu is an ISO 9001:2015 Registered Organisation with the British Standards Institute and is an IMI Quality Assured Training Centre. Please note that IMI is predominately a UK Quality Standard with training and testing conducted in the UK, therefore this may not apply to Viezu’s Approved Dealers outside of the UK. All Viezu Approved Dealers are professionally trained to very high standards and are equipped to perform all your tuning needs. 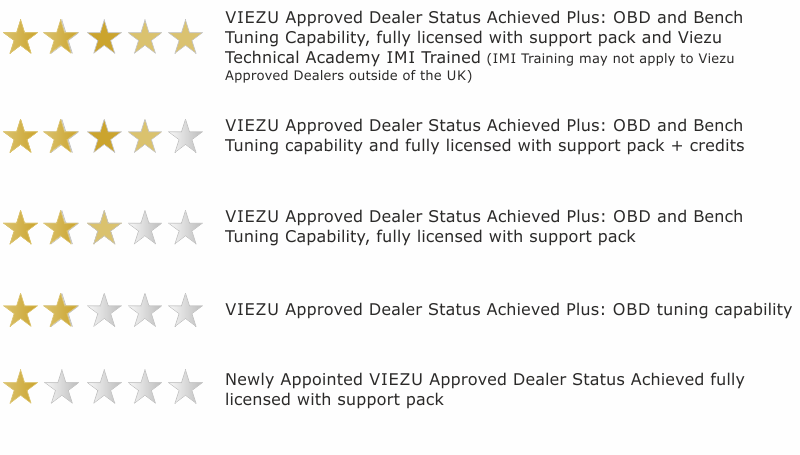 Viezu Star Ratings are based on training and the types of tools, software and tuning capability each Viezu Approved Dealer is able to support. On board diagnostic port (OBD) Tuning is the most commonly used tuning function and All Viezu Approved Dealer have this functionality. Bench Tuning is more complex and requires specialist tools to perform. A fully licensed support pack ensures the very latest vehicle protocols released can be tuned which is great news for newer vehicles. Viezu welcomes feedback on the Customer Service and Support its Approved Dealers provide; if you would like to submit any feedback please email us at info@viezu.com.